Please place a check next to the type(s) of spots you are interested in. You may check more than one if you are flexible, but please put a note in the comments if you are looking to rent more than one spot. The Manchester Craft Market is located in the Sears wing of the Mall of New Hampshire, in our very own storefront. During the Feb-Sept season, the store will be open Wednesday-Sunday. Your digital signature on your application acknowledges that you have read ALL of the rules laid out below and agree to them. Lease: For February – September 2019, leases are on a month to month basis. Rent is due by the 15th of the previous month (i.e. February rent will be due by January 15th, etc) a $20 late fee will be charged after the 15th day. 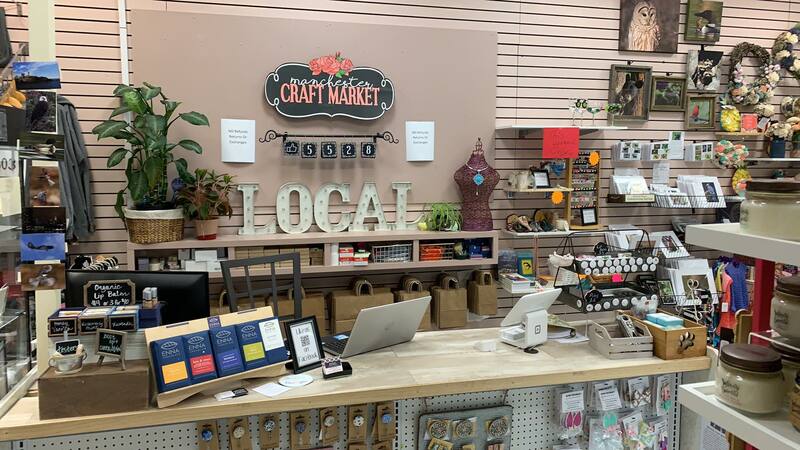 If you have not notified the Manchester Craft Market that you will be vacating your space prior to the 15th of the month, it will be assumed that you are staying and you will be expected to pay your invoice. You are required to remove your items prior to the end of the day on the last day of the month. Items left for 30 days past your lease become store property. In addition to your space rental cost, credit card fees are deducted from any sales paid via credit card at 3%. And The Manchester Craft Market will retain 5% of any sales over $300 in one consecutive month. • Your space must be returned in the condition it was received in. This includes all hardware being put away in its proper home, and the space being clean. • You will only have your handmade items in your space. And only the items included on your Inventory sheet and item types that you were juried for. • We do not offer refunds under ANY circumstances. This includes refunds on your items, and booth rent. • Inventory is added to the store with the understanding that The Manchester Craft Market is not held liable for any loss, theft or breakage of items, or displays. Re-stocking: I will gladly restock your items throughout the month. The restock items must be included on your Emailed inventory spread-sheet and be in a tote with your name and business clearly legible. Every Friday and Saturday from 9am-10am will be “restock time” where you can re-arrange your space and restock items. I reserve the right to adjust your display due to sell through, or to make it more visually appealing. The Inventory system will only be updated on Thursday evenings, meaning all inventory updates for inventory coming in on Friday or Saturday morning must be received by Thursday at 8pm. Any pre-paid rent will not be refunded for breaking your lease early. Where and when do I go for restocking/load in? We have a Back Entrance to be used for all “Deliveries” You can access the back door through a service corridor. When Looking at Red Robin, Turn to your left, there is a fenced in area with dumpsters. In the corner of that fenced in area there is a smaller fenced in area with a single door, enter this single door, follow the hallway to the end. You will find our door (marked with a sign) just before the last door in the hallway. Every Friday and Saturday from 9am-10am will be “restock time” where you can rearrange your space, and restock items. All items in your restock bin must be listed in your inventory. 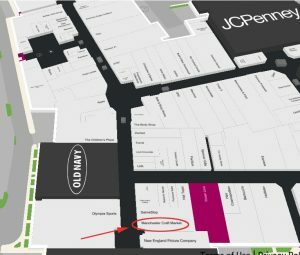 There are many reasons that licensed items are not allowed in our store, however the biggest reason is that it is specifically forbidden in the lease with the mall. There are lots of stores in the mall paying large sums of money to have the right to sell those licensed items and the mall is protecting the interests of those parties by not allowing the sale of licensed/copyright items in our store. I’ve read that the First Sale Doctrine allows me to use fabrics, stickers, and other already-printed licensed items in items I sell. Why am I unable to sell those items in your store? each of these pieces of information is sent in, and LABELED on each and every item you bring to the store. Going forward, you will not be allowed to set up your items until it is confirmed that inventory has been received and checked over. Where do I get the SKUs for my items? Your item SKU is made up of 2 things…your Vendor ID and a 4 digit item code. For example, if your Vendor ID is 110, your first item might be 1101001, and your second 1101002, etc. The 4 digit code you use is completely up to you, however you must keep track of your codes so that you can include them if you add quantity of existing items and so that you do not duplicate numbers. Please keep track of the numbers you assign to your items. I have some new items I’d like to add to my booth mid-month, can I do that? Inventory additions and adjustments must be keyed in no later than Thursday at 8 p.m. for that coming weekend, so be sure to get the items in the system or you will be asked to hold off until the following week. Do you put the price tags on my items? No Sellers are required to label all of their items prior to bringing them into the store. I came in to check on my display and some of my items have been rearranged. Can you tell me why that might be? As stated in the contract, the owner reserves the right to rearrange merchandise as necessary to help facilitate sale of your items, if they are impeding another vendor’s ability to use his or her space, or to rotate the floorplan. What do I do when my lease is up? All items must be removed prior to close on the last day of the month. Please plan accordingly. Items left beyond the end of your lease term will become property of the store after 30 days. Checks will go out by the 15th of the following month. PayPal payments may be available sooner. Can you roll my sales over to pay for the next month’s rent? How will I know if I sold anything? Reports will be sent weekly to those who have sold items during the previous week. • There is a 3% credit card processing fee for credit card sales. • Any handwritten or printed inventory sheets will be charged a $10 data entry charge. • Any items violating the no characters/no sports teams rule will be charged $25/item, after 2 chances, your lease will be terminated, and no refunds will be granted. • Rent not paid by the 15th of the prior month will be assessed a $20 late charge.